See more objects with the tag interior, decoration, home, dining, organic, figurative, decorative, leaves, eating, biomorphic. This is a Dessert spoon. It is dated ca. 1890 and we acquired it in 1996. Its medium is silver. It is a part of the Product Design and Decorative Arts department. This is a rare opportunity for the museum to acquire a superlative service of flatware that meets the highest standards of design criteria and embodies our mission: to explore the many ways that design affects our daily lives. Although this service was probably intended as much for display as for use, it was certainly designed to be a functional element in a final dinner course. 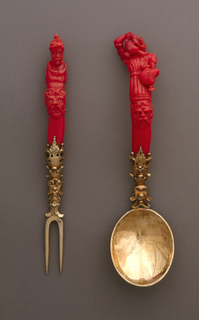 It is a wonderful example of the expansive, highly specialized sets of cutlery that were considered ceremonially and functionally necessary for the elegant dinner table in late 19th-century Europe and America. Each piece of the service is an entirely unique sculptural unit. This, in combination with the fact that all of the pieces are numbered to correspond with slots in the case trays, suggests that the set was very special, perhaps even made for display at the Paris 1889 International Exhibition.